21st Commonwealth Games are about to start in 4 days’ time in Gold Coast, Australia but the focus of Australian sporting fraternity is far from it thanks to some soap opera like drama 11000 km away in South Africa. In past month, some exceptional cricket was witnessed but also some ugly scenes on and off the field were witnessed by this generation. Be it discourteous Nagin-dance by Bangladeshi and Sri-Lankan players on the field, the captain and the substitute players holding the game hostage after a no-ball controversy in the semi-final of Nidahas Trophy in Sri Lanka [Also read: The Curious case of Sri Lankan Cricket], the dressing room face-off between David Warner and Quinton De Kock in Durban, the shoulder badging of Rabada and Smith and the legal battle that followed, the apathetic crowd in South Africa too had a part to play when the sport made headlines for reasons other than the game. But things escalated last Saturday when a 50-second footage of Cameron Bancroft was aired on the giant screen by the home broadcaster rubbing a side of the ball with a foreign yellow looking object between his fingers in the last session of the day. Even the Australian coach Darren Lehmann was bemused and instructed substitute Peter Handscomb to get on the field and make some sense out of it. Panicked and nowhere to hide, Bancroft tried to get away by hiding the yellow ‘tape’ (later revealed to be a sandpaper) in his underpants before being inquired on-field by the umpire. Satisfied with the condition of the ball, the umpire went on with the game. After the day’s play, the cricketing world came to a halt when Steve Smith, the Australian captain and Cameron Bancroft confessed of premeditated the plan to work on the ball to gain reverse swing on a pitch which wasn’t doing much to trouble the Proteas batsmen. Steve Smith admitted that the ‘leadership group’ knew about the plan and it was an error of judgement on his part. The term ‘leadership group’ sounded very cryptic and speculations were made of the possible involvement of the coach’s involvement in the malignant conspiracy. Cricket Australia was quick to act and sacked Steve Smith and David Warner from captaincy and vice-captaincy with immediate effect with Tim Paine to lead the team for rest of the test despite Smith’s statement the previous evening that he still feels that he is the best guy to lead the team. This swift action shows the gravity of the situation and how it has not fared well with the public in a country which has always taken pride in their sporting achievements. To be labelled as ‘cheat’ didn’t go down well with them and the trio of Smith, Warner and Bancroft had to face the heavy backlash from home. With initial investigation almost immediately launched by CA, ICC too was quick in levelling charges and sanctions on the players. ICC took the conservative approach and looked at the issue impartially and went by the book to dish out maximum punishment for ball tampering: 3-4 demerit points and 50-100% match fees as fine. And by the virtue of hitting the threshold of 4 demerit points over the 24-month period, Steve Smith was banned for 1 test match. But there was a section of fans especially Australian fans who felt that the players got out of this mess very easily. Also, surprisingly no one else from the tainted ‘leadership group’ was sanctioned as ICC only has provisions for penalizing the player tampering the ball and the captain. The flaw in the ICC’s method was conspicuous. Though ball tampering wasn’t a legal crime as heinous as match-fixing, it was a serious cricketing crime and should’ve harsher implications. CA was quick to announce that they will dish out their own sanctions to the players as soon as they complete their investigation before the start of the next test at Johannesburg. Let us understand what prompted CA to take measures over and above the ICC’s sanction? Sport is a vital ingredient of Australian cultural fabric. They believe in playing hard and it is totally acceptable to use methods to get under the opposition’s skin. Coming to their national sport and the one in which they’ve been World Champion for 5 times now, the Australian Cricket team is famous for all the chirping, sledging and fighting hard with words along with the bat and the ball but they were never disgraced before and accused of being a cheat and playing unfairly. So, this incident brought down with it nation-wide ignominy. They were even some radical cries calling for the life bans on Steve Smith and his ‘leadership group’. But one thing was sure, coming days weren’t going to be easy for the batsman with Bradmanesque average. Also, the role of David Warner in the whole sad saga wasn’t clear. When the investigation was completed, and sentences were announced, it was more of a statement by CA that the culture of Australian Cricket needs to change for the good and thus example was made of the tainted trio to reinstate their zero-tolerance policy towards the breach in the integrity of the game. Somewhere, other nations secretly enjoyed the sorry plight of Australian cricket for schadenfreude as for generations the men in baggy green had tormented its opponents ruthlessly. 12-month bans were handed to Steve Smith and David Warner who turned out to be the mastermind behind the whole idea to rough up the ball using a sandpaper and 9-month ban was handed to its executioner Cameron Bancroft. Also, it was stated that David Warner will never captain any Australian side again while Steve Smith will have to wait for at least 2 years before leading Australia. At this point, some senior players sympathized with Steve Smith as his fault was just to allow this silly idea to materialise but David Warner had no such luxury. Some of his own deeds came back to bite him. During 2016 South Africa tour to Australia, Du Plessis was caught up in similar ball tampering controversy better known as the MintGate. Warner had then said: "I just know from an Australian cricket perspective, we hold our heads high and, you know, I'd be very disappointed if one of our team members did that and how they were reacting. The rules are in place for a reason, if you're not going to use them, then why bother having them? That's just the fortunate thing these days, they've got the rules and they're going to stand by their decisions, and I think that's a good thing." Unfortunately for Warner, that statement came back to haunt him a couple of years later in the Newlands ball-tampering saga. The sanctions didn’t just hurt the reputation of this tainted trio, their pockets too were hit hard. While Steve Smith and David Warner were banned from Indian Premier League 2018 by BCCI, Cameron Bancroft lost his contract with English county Somerset. The sponsors of these cricketers pulled out of their contracts and some more financial trouble awaits them and Cricket Australia. Australian coach Darren Lehmann took the moral responsibility of the whole episode and stepped down despite having zero involvement in it. The team must rebuild from the scratch with an important tour to Pakistan (In UAE or Malaysia) coming up before marquee test series against India at the end of the year and the big World Cup next year in June followed by an away Ashes series. In the wake of this unfortunate event, ICC has stated that they will have to review their code of conduct. 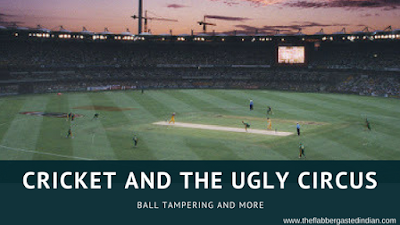 It is not that ball tampering hasn’t been attempted before, but all the earlier attempts were conceived on field intuitively. At Newlands, the plan was hatched during lunch on day 3 making it a premeditated attempt at systematic cheating. Such was the bizarre nature of the incident that there is no precedent to it making it difficult for ICC to take the appropriate course of action and hence, they too had to face their fair share of criticism.Sadly, for a sport, the off-field drama made more headlines but with some cricketing action this week and the big ticket IPL starting next week [Also read: IPL: Fooling India since 2008? ], the fans can wish that on-field action will take the front seat again and every stakeholder of the game will learn from this ugly circus and such unfortunate events can be avoided in future.